Data-driven companies are also goal-driven companies. ChartMogul is making it easy for companies to set, share and hit their goals with our latest feature. Setting goals is incredibly important. Goals can be really powerful motivators and help keep your team focused and working together to hit a common objective. Plus, nothing feels better than hitting — or better yet, surpassing — a number you’ve set for your team. 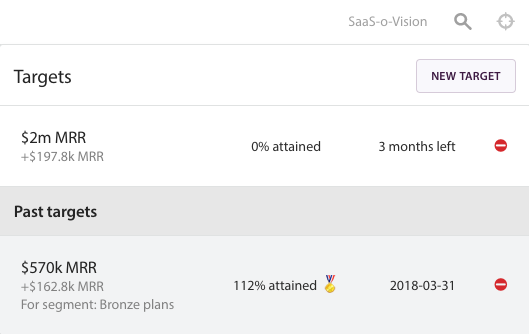 As of today, you can keep track of your most important business goals directly in ChartMogul with our latest feature, Targets. With Targets, ChartMogul customers on both free and paid plans can set Targets for any metric our platform tracks — ARR, free trials, cash flow, you name it. You can set monthly, quarterly or annual Targets to keep tabs on short-term and long-term goals. Have a goal tied to a specific group of customers? For example, say you want to increase the MRR associated with your Bronze Plan subscribers, or for your customers in the APAC region. You can set specific targets for those segments. A modal will appear with instructions on setting up your Target. Select the metric you want to track, enter your goal number, identify a time period and, if you’d like, select a segment. There, you’re ready to track your goals in ChartMogul! Targets will be moved to Past Targets (located under your current Targets) once the set time period is complete. This gives your team a look into any historical targets and features the original Target, the time period covered and whether it was attained (or exceeded). Once your Target’s set up, click on it and you’ll be taken to its associated chart. Now you can see your current performance and understand how far you are from hitting your goal. Hover over the icon and you can view your progress and the time left until your deadline. Your in-chart Target point will be red if you haven’t yet hit your goal. Once you’ve hit your Target, that point will turn green — congrats! Targets are visible to everyone in your company with a ChartMogul account. This is a great way to keep teammates on the same page and focused on hitting your company goals. There are two ways to view Targets: Users can either go through the top navigation to see a drop-down with a full list of current and past Targets, or they can change their chart settings to show any set Targets by toggling the Show targets option to ON. Now, as users click between charts in ChartMogul, any set Targets will be shown on their related chart. Track Your Progress — and Celebrate Goals! Whether you’re starting out or scaling up, it should be easy to set and share goals and track your company’s progress. That’s why Targets is available to every ChartMogul user. If you haven’t given ChartMogul a try, start your 14-day trial to take Targets — and the rest of our platform — for a test drive.